Welcome to the Ocean Ritz vacation rental properties! This beautiful condominium complex offers so much, especially the fact that it sits right on the sands of the Panama City Beach! 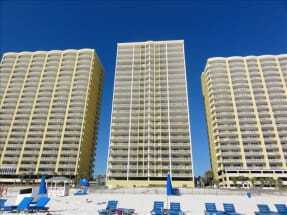 Emerald Coast by Owner happily offers you a number of properties, equipped with elegance and luxury! When you stay here, we offer up to 4 bedroom 4 bathroom condos, with large living space and so much more! The amenities include the hot tub, the pool, the lovely scenery, the amazing outdoor area on the balcony overlooking the coast and more! People down here love the area, so take a leap! Go parasailing, deep sea fishing, paddle boarding, rent a jet ski, race go karts, go to Wonderworks or Ripley's Believe It or Not! Museum, there's still so much more to do! The amount of excellent seafood and traditional food spots in the area is large and you don't want to miss out on a great meal and awesome time from any of them! Scroll down now to view all of our listings in Ocean Ritz.When you book with ECBYO, we put you in direct contact with the property owners or managers. Booking direct with the property owner cuts out the middle man and makes the booking process more enjoyable for everyone. Contact the property owners directly with any questions!